East meets West : a fusion of eastern and western printmaking. 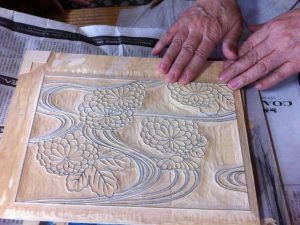 Japanese woodblock printing (Mokuhanga) is a technique which involves inking the block with watercolour paints and specialist brushes as opposed to western forms of printmaking which mostly utilize oil based inks applied with rollers. Today, Mokuhanga only differs slightly in technique from those prints we recognize by artists such as Hiroshige and Kuniyoshi. The ‘greener’ philosophy of Mokuhanga being entirely waterbased fits well within the contemporary world. 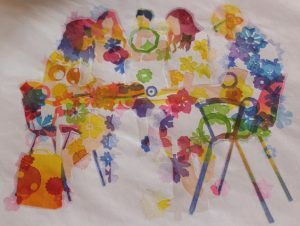 The paint is applied to the image with specialist Japanese brushes and the image transferred to paper with the aid of a pressure pad known as a baren. All tools and materials including cutting tools and brushes are provided. 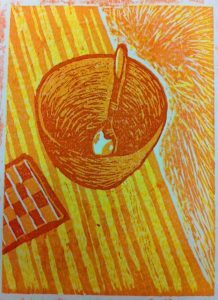 Over the course of this four day workshop , participants will learn how to carve and print 2-3 blocks using ‘Kento’ registration, to achieve a colour print. Elspeth will oversee each stage in the process and everyone should achieve a small edition of colour prints to take home. 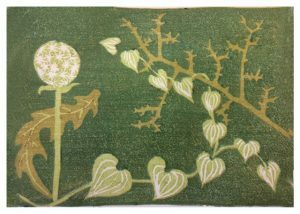 Western woodblock printmaking will also be demonstrated and where relevant, this technique may be used alongside the Mokuhanga method to achieve the final print or to make a black and white image. We will be working to a maximum size of 17 x 24 centimetres. Images may be portrait or landscape format. Further instructions will be sent out nearer the course suggesting things you may want to bring. Some specialist Japanese papers will be supplied , and further paper may be purchased. For further information or to book a place on the course contact Elspeth here. Elspeth Lamb taught Printmaking at the Edinburgh College of Art for 21 years and over the last several years has studied with master printers and carvers in Japan. In September 2014 she presented a paper on her research into papermaking and print in Tokyo at the Second Mokuhanga Conference held at Tokyo University. 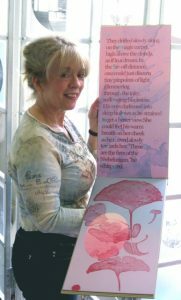 Her book, “Papermaking for Printmakers” was published in 2006 by A&C Black, Bloomsbury Press ,London. She is a practising international artist and has been an elected Academician of the Royal Scottish Academy since 1991.